The Total Solar Eclipse of June 30, 1954, is distinguished in no small part by its reach. Totality stretched from the US to Eastern Canada, over Greenland, parts of Scandinavia, Eastern Europe through Iran, Afghanistan and to Northwestern India. The most obvious historical connection is to a conflict between Afghani Pashtuns and Pakistan. I make this statement with some degree of hesitation because as the saying goes, a Pashtun is only at peace when he’s at war. Afghani tribesmen are the de-facto military and warfare is taught alongside lessons in the Quran by traditional Afghans to boys as young as six., Therefore, we need to keep in mind that conflict is something of a natural state. The difference here, however, is that the conflict is between what we could well call brothers. In fact, the notion of hard boundaries between some Islamic countries is itself something of a rarity. In addition, the politics existed and persisting between India, Pakistan and Afghanistan are so convoluted and deeply ingrained, that I will not be rehearsing them here in any detail. 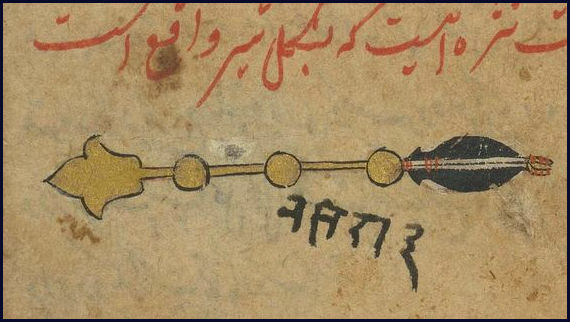 I’m more interested in the larger symbolism and particularly as it relates to this eclipse, However, this particular, little-discussed incident represents something of an epiphany or crystallization of the larger theme of serious and protracted wars that would have included Kashmir and therefore India and Pakistan – conflicts that continue to this day. The war in Kashmir is at least as old as the time of Partition. It has hosted what has been called a shadow war certainly between India and Pakistan, but Afghanistan has also been involved. The strategic position of Afghanistan changed when Pakistan was born. Instead of being bordered by a largely Hindu population, it was now neighbours with another Islamic one. Nevertheless, this was still early days and the porous border with Afghanistan was to some extent exacerbated by her landlocked position. There was and still is an antagonism between Sunni and Shia Muslims and Afghanistan is also neighbours with predominantly Shiite Iran. Even after all this time, the lot of Shii Muslims in Afghanistan is not good and is perhaps even worse in Pakistan. I don’t think it would fair to suggest that this eclipse alone augured for the conflicts between Pakistan and Afghanistan, but it is both relevant and highly telling of the greater conflict. 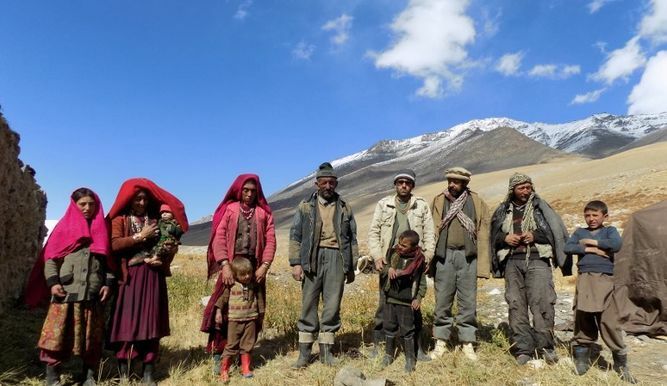 Pakistan has a large Pashtun population beyond the concentrations we find in Waziristan, a mountainous region covering the North Waziristan and South Waziristan agencies. On 14 August 1947 (27th of Ramadan in 1366 of the Islamic Calendar) Pakistan gained independence. India gained independence the following day. The date given for the present state of Afghanistan is 4 August 1747, 12:01 PM in Kandahar. So, to put the conflict in context, this is not quite seven years into the young lives of either country. We don’t need to consult the chart for the creation of Pakistan for our immediate interests. It is impossible not to notice that the three countries are Leo. They have many things in common and many things to fight about. Most obvious of course is the string of Cancer planets and luminaries in the 8th House of Death and Inheritance, themes which are very much at play, perhaps more so for Pakistan. Although history has celebrated the Independence of India and the creation of Pakistan (Land of the Pure) the depth and magnitude of the wound required to create a land for India’s Muslims are considered mostly within the context of the immediate results, such as the widespread violence between displaced Hindus and Muslims. What is less often considered is the longer-term effects of the amputation. Pakistan was no small concession. It is an enormous country of 340,509 sq m., all of it once part of India. Moreover, the land had been handed over to what had not so long ago been invaders and often very harsh rulers. an estimated three hundred million Hindus were massacred and their religious sites destroyed over a three-century span of time. Members of other religious groups were also severely persecuted over the centuries. This mostly gets lost in the smoke and mirrors that constituted the politics of India and the British Empire. This raises the issue of duplicity, as shown in the 7th House. Nevertheless, Gemini is, after all, the sign of the twins. The Lord of the Descendant is Mercury in Cancer but retrograde in the 8th House. It’s the Day of Mercury, but the Hour of Jupiter. The latter is also the Almuten of the chart. This brings us to the Lunar Mansion in which the Eclipse occurred. The 8th Mansion is named al-Natra, meaning the Crib or Gap. It occupies 0* Cancer to 12* Cancer 51’What would seem utterly hopeless at first glance, turns out to be representative of opportunity. The two versions are not incompatible. In the short term, peace and understanding prevail. However, we know that corruption is rife in both countries. 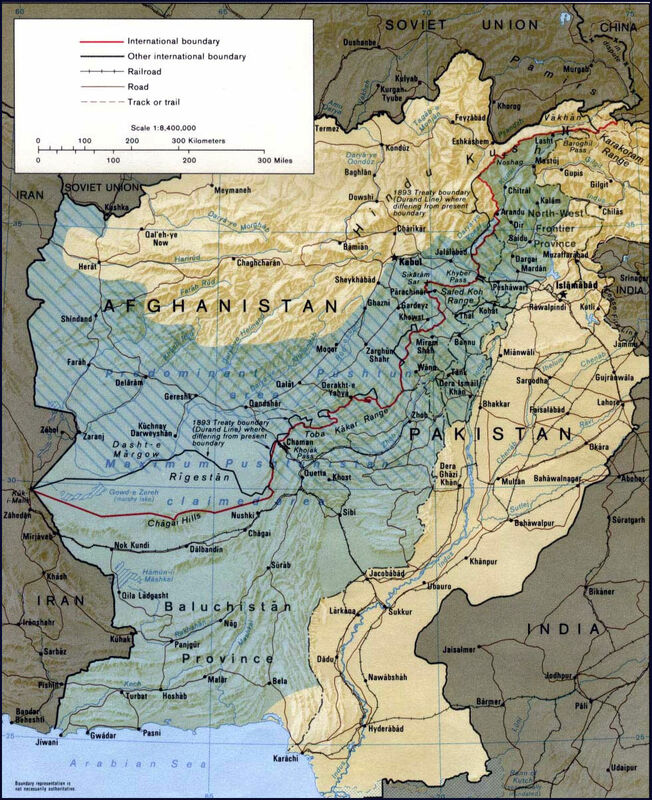 The core issue was and still is the recognition of the border between Pakistan and Afghanistan, known as the Durand Line. The issue was old even before the inception of Pakistan. The history and ongoing strife are far too complex to rehearse here in detail and that isn’t the main thrust of this article. Everything is ephemeral in the Sub-Lunary Sphere and what this chart and eclipse show us is how the details, the smaller stretches of time, fit into the larger picture which is ultimately more massive than the human mind can fully comprehend. Neverthe; less, in the short run, all looks quite encouraging. We have a truce rather than a permanent peace, which is what we might expect. 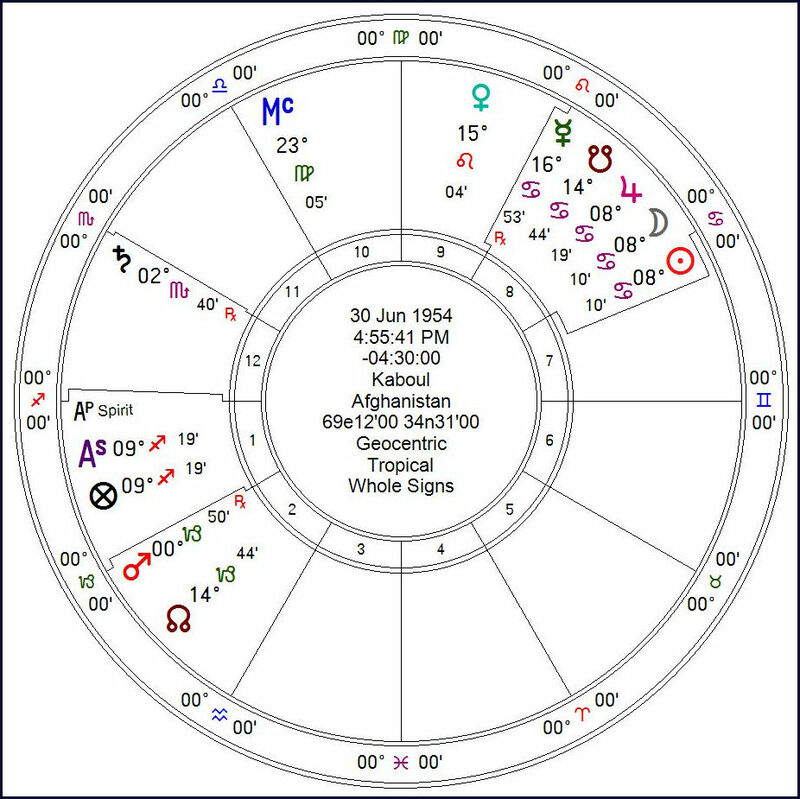 The exaltation of Jupiter in Cancer lends a great deal of good-will seems well and Venus in the 9th House is quite splendid for two Islamic countries settling border issues. saturn is not respecting the Ascendant, except by aversion. This does matter, however, because Saturn is all about boundaries and limitations of all kinds, and the party contesting the border can’t see that. Saturn is ion his House of Joy only because he can do less damage there. Be that as it may, Mars is on the same Axis and the Eclipse – known as the axis of Hades and he has just entered Capricorn This axis is after all, about possession of material things, either your ‘own’ or what is inherited. Again, this theme fits perfectly with the matter at hand. Mars is in his sign of Exaltation, but Retrograde. The antagonism is enough to get things moving, but not enough to kybosh all that might be gained. Ficino tells us that Mars is soothed by Venus and Saturn is soothed by Jupiter. Both of these are operative in the outcome, albeit a temporary one. Venus accomplishes this by her position in the 9th House of religion. Islam itself is under Venus and both countries are Islamic. That brings an ultimately unshakeable degree of harmony, despite the boundary issues. She is also in the sign of the Sun, and we are discussing two Leo countries. The 9th is the Joy of the Sun. Jupiter, on the other hand, is strong, even though the house position is weak. He is still the Almutren of the chart. in his exaltation with a Cancer Moon. He forms a trigon with Saturn and this seems to seal the deal. At the end of the day, the parties in conflict are they are brothers – and like brothers that will continue to scrap but always find a way back to each other. According to Vinay Kaura, of Sardar Patel University, as of Jun 27, 2017 . “no Afghan government, including the present one headed by President Ashraf Ghani, has ever recognized the legitimacy of the Durand Line, which runs through mountainous terrain and remains largely unpoliced.” (MER. Jan, 2017. But what does a border actually mean to people who are partly nomadic and for the most part have no real concept of a nations state? Considering both countries are strongly Muslim, the concepts of ummah and caliphate have much more resonance and particularly with the tribal populations of both countries. Ummah (Arabic: أمة‎ [ˈʊm.mæ]) is an Arabic word defined as “community”. It is distinguished from Shaʻb (شعب [ʃæʕb]) which means a nation with common ancestry or geography. Thus, it can be said to be a supra-national community with a common history. When Muslims speak of the Ummah, they would include Muslims from all countries. The Islamic ideal is a global Caliphate with all non-believers subjugated, so national boundaries between Muslims are going to produce conflict between tribal and Islamic values. This is part of the never-ending story and there were and will continue to eclipses that are immediately relevant. My primary purpose here was to show how the eclipse describes the situation so eloquently. This entry was posted in Cancer, Eclipses, Pakistan, Traditional Astrology and tagged Afghanistan, Solar Eclipse. You say that the 1954 eclipse stretched from the US to Pakistan and Afghanistan. 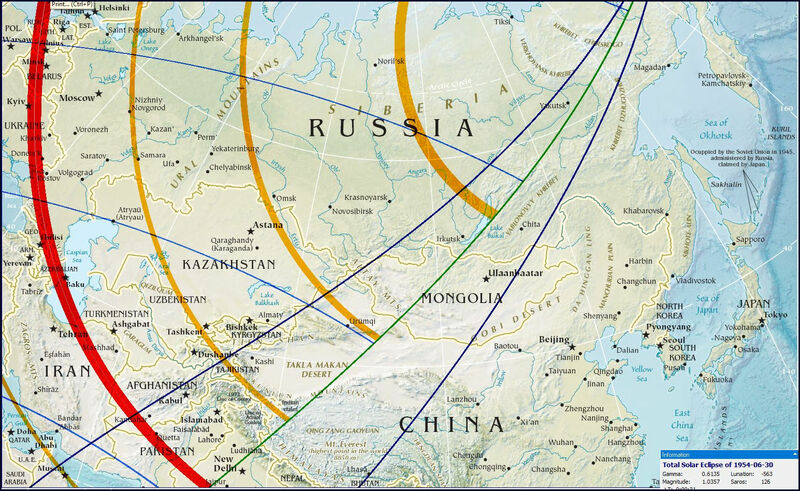 I would simply add the similarities between the 1954 eclipse chart and the celestial situation of 2001, when Afghanistan-based al-Qaeda launched its 9-11 attacks against the United States. In 2001, the Cancer solar ingress coincided with a solar eclipse with Mars very nearly in exact opposition, after having turned retrograde six weeks earlier at 29 Sagittarius. Between the 2001 eclipse date and 9-11, Mars returned to direct motion, crossed the retrograde point and passed the 1954 Mars point by one degree. By then also, Jupiter had reached and slightly passed its point in the 1954 chart. Perhaps there are also relevant connections to the date of Osama bin Laden’s killing in Pakistan, but I will leave that for others to uncover.